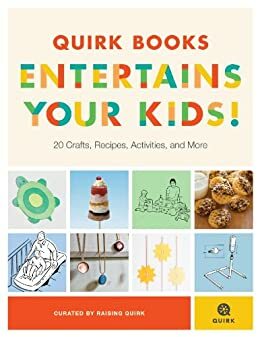 This summer, Raising Quirk’s mission is to keep your kids from ever having to say “I’m bored.” So we’ve rounded up our favorite crafts, recipes, games, and activities from Quirk Books titles and jam-packed them into our funnest, awesomest, and kid-friendliest e-sampler yet. Whether you’re taking your family on the road or stuck indoors on a rainy day, we’ve got you covered. Make Trail Mix and Hit the Trails! Children don’t come with an owner’s manual, so Raising Quirk brings together advice, activities, entertainment, and, most important, other parents who still feel kinda like kids themselves. Our motto: We help cool parents raise cool kids. After all, parenting is a lifelong adventure, and we’re all in it together. Consider us your virtual playgroup and join us at Raising Quirk online. With summer vacation just around the corner, new activities to keep the kids busy and entertained are always welcome, so I was hoping to see good things from Quirk Books Entertains Your Kids, a sampler of activities from 14 books from Quirk Publishing. Sadly, many of the highlighted activities were perhaps not very well chosen. Let me tell you about a few of them. The first activity in the book is Robot Bites from Noodlemania! : 50 Playful Pasta Recipes. The robots are cute enough, but the "recipe" calls for 1 bag of Kraft Homestyle Macaroni and Cheese, which includes a package of bread crumbs you are instructed to discard. Too bad you didn't save those breadcrumbs though, because in step two, you'll need a cup of bread crumbs! While the robots are somewhat amusing, if that is the sort of thing you want to teach children to "cook", this seems rather wasteful to me. Some of these activities are dangerous - dangerous to the child, dangerous to the bystanders and perhaps even dangerous to the house. Case in point - Futaleufú Mattress Rafting from The Art of Roughhousing. In this activity you are instructed to grab a toddler mattress, twin mattress or tumbling mat, place it at the top of the staircase, jump on the mattress with your child and push off. Talk about a disaster in the making! You'll ruin the mattress and might very well damage the stair railing or the wall. Injuries on landing are a distinct possibility. Then there is that other little problem you don't have to be a parent very long before you become all too familiar with. Once this has become "allowed", the kiddo will sure as there are little green apples think it is just FINE to do when you aren't around to supervise! There is an extremely good reason that sliding down the banisters has been a forbidden delight of childhood for centuries. If you encourage this at 4 or 5, can you imagine how your children will treat their home at 14 or 15? Talk about Animal House in the making! Even more dangerous is the "Yakima! Choreograph a Fight Scene" activity, also from The Art of Roughhousing. All the parents in the neighborhood are sure to thank you for encouraging exactly the kind of backyard "fighting" that leads to mock "wrestling" stunts, grave injuries and the knock-out game a few years down the road. What WERE the authors of this book thinking? Some of the activities are so simplistic I wouldn't consider paying for a book full of them (cutting out a shape to thread on a straw is but one example) and not a single one of them includes even the vaguest guideline of what age group a given activity might be suitable for. Grandma's $0.02 - I saw very little here that was even imaginative, never mind different than the activities you'll be seeing in the coming issues of all of your favorite women's and parenting magazines and some of this is either downright dangerous or guaranteed to create problems down the road. The sampler is, however, free. Grandma advises an abundance of caution. There are a lot of good ideas in this book and some just so-so, but isn't that the way of it all? There are different sections with one picture to help. Crafting:Starburst Straws: encourage kids to stay hydrated. Cooking: Robot Bites are made from Mac &Cheese and Bread Crumbs. Outdoor Adventure: Wearing sunscreen is not an option. Give it a fun name. Get Your Kids To Clean Up: Have many five minute clean up times each day. Rainy Day Aintics: To many good ones to pick from. Listed above is just one item in each section. There are others. Fun book to let the kids pick it or yall pick it together. I found this book on a website for free for an honest review. I can hardly believe that this book was free! It's got as many crafts and recipes and things in it that a regular full-sized book would have it in, unlike some of these other free books that are more like pamphlets. There are lots of crafts that my daughter was excited to do like make a bottlecap picture frame. For reference, she is 7 and a half, and needed a little bit of help with these activities. So don't think that you can just hand over the book and say "Have fun!" it does require some help from a parent or maybe older sibling. Not as many projects as I thought there would be. I find that pinquest had more. It's a okay book but I wouldn't buy it.